India Today-Karvy Insight poll shows NDA winning 237 seats compared to UPA’s 166. ABP-CVoter pegs the figures at 233 and 167, respectively. New Delhi: India is heading for a fractured mandate in the upcoming general elections as the ruling National Democratic Alliance (NDA) is unlikely to secure a majority in the Lok Sabha, two surveys suggested Thursday. The United Progressive Alliance (UPA) has been predicted to better its tally compared to that in 2014 but it would secure less than the NDA, making regional parties the king makers, according to surveys conducted by India Today-Karvy Insight and ABP News-CVoter. The polls come just weeks before the announcement of dates of the next Lok Sabha elections. 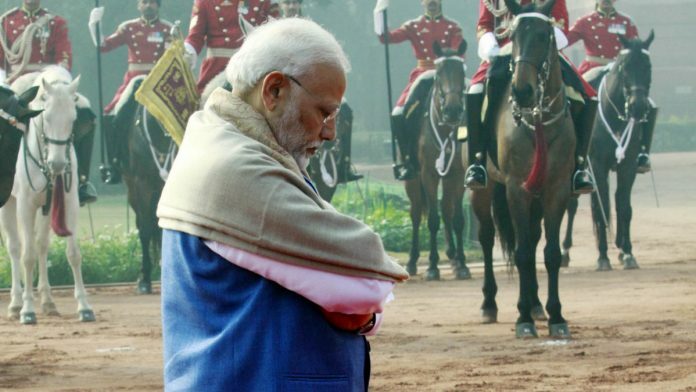 The India Today-Karvy Insight “Mood of the nation poll” showed that Prime Minister Narendra Modi still remains more popular than his principal challenger, Congress president Rahul Gandhi, but the gap is narrowing. The survey predicted the NDA winning 237 seats, 99 less than its 2014 tally and the UPA securing 166 seats, 107 more than it got in the last elections. The survey covered 12,166 people in 97 parliamentary constituencies and was conducted between 28 December 2018 and 8 January 2019. It put the Bharatiya Janata Party (BJP)’s figure at 202, down by 80 from 2014, and the Congress’ at 97, up by 53 from the last election. The survey also showed that Modi’s popularity rating is at 46 per cent, 12 percentage points more than Gandhi’s, but it’s a 19-percentage point drop from a similar January 2017 poll. In January 2017, Modi’s popularity rating was at its peak at 65 per cent while Gandhi’s was at 10 per cent. The ABP-CVoter survey — “Desh ka mood survey” — put the NDA’s tally at 233 seats and the UPA’s at 167, while ‘Others’ (regional parties) would get 143 in the 543-member Lok Sabha. The poll covered 22,309 people and was conducted between the third week of December and the third week of January. Modi, who swept to power in 2014, has been facing criticism over lack of jobs and the agrarian crisis. “In a nutshell, a popular prime minister (Modi) is facing stiff challenge from a united opposition,” ABP reportedly said summing up the results of its survey. “Also, his popularity is facing headwinds due to depressed economic sentiment. A combination of the two may lead to domino effects of driving away the fence-sitters and rallying the faithful of opposition,” it said. The ruling BJP will make up some of its losses with victories in the eastern states where its influence has been limited in the past, said the poll. The ABP-CVoter survey also showed that the BJP has lost massive ground in its traditionally strong Hindi heartland bastion of Uttar Pradesh. It said the BJP is likely to suffer a huge setback in Uttar Pradesh owing to the recent coalition “Bua-bhatija” coalition between the Bahujan Samaj Party and Samajwadi Party that is likely to sweep and win 51 out of 80 seats. However, there is a silver-lining for the NDA coalition in Bihar where the Modi and Nitish Kumar alliance is expected to sweep the polls, winning 35 out of the 40 seats. In West Bengal, Mamata Banerjee-led Trinamool Congress emerged as the runaway leader, winning 34 of the 42 seats. The Election Commission it yet to announce the dates for the Lok Sabha elections.